Nichole & Elisabeth will share the fuss of fussy cutting & sign books. We will provide the fizz in your mimosa. We have started classes. Sign up online. It has been a whirlwind of activity here at Sew Together. So many balls to juggle, hats to wear and things to figure out. It has been exciting and challenging and we are loving the way things are taking shape. New fabrics arrive every week. There is nothing like the thrill of getting a bunch of plain brown boxes and finding out what fabric treasures are inside. The shelves are filling up with great fabrics. You have got to check out Carolyn Friedlander's Blake Knits. They are seriously the softest knit jersey ever! We have her quilt samples on view and Tee Quilt pattern in stock. Everyone is asking about sewing classes. We love to teach and make new converts to our passion of quilting and sewing, so the beginner classes are up and ongoing. We are continuing to develop our roster of classes. Stay tuned as we finish up samples and post new and more challenging classes. 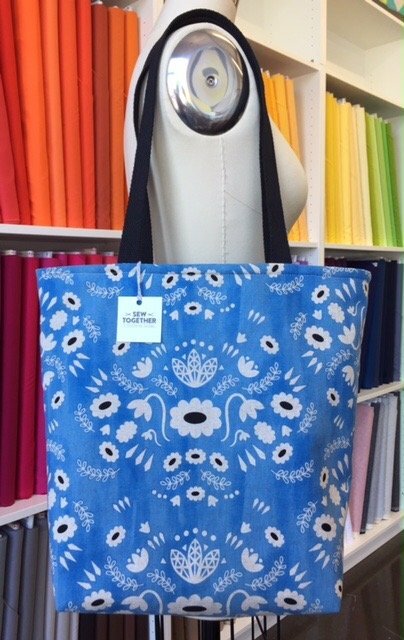 We also offer Studio Time for the independent sewist who needs a place to work and find community. Call us to reserve Studio Time or to get more details. 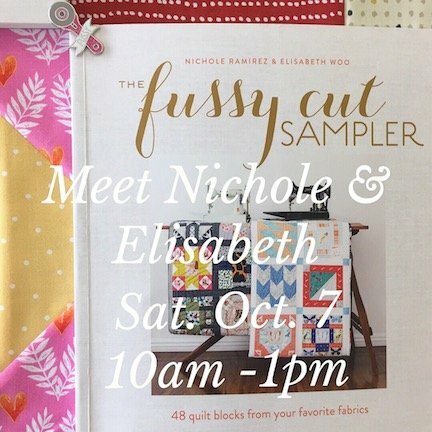 We are super excited to have Nichole Ramirez and Elisabeth Woo Hardy, the mavens of The Fussy Cut Sampler coming on Saturday, October 7, from 10am to 1pm, to sign their awesome book. This is going to be a really fun morning finding out what the fuss is all about. Fizz will be available for sipping. The book & flair will be available for purchase. 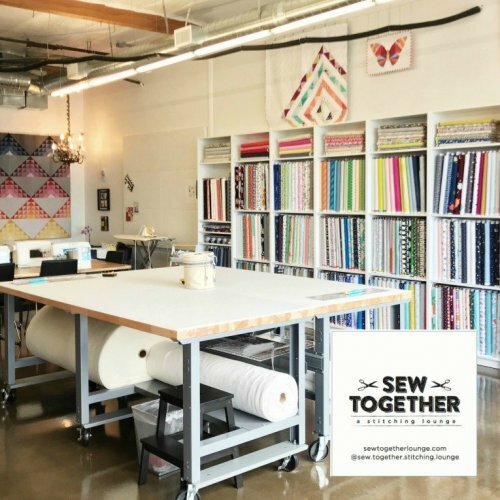 We are grateful to all our friends and family in our amazing quilting & sewing communities who have made a point to come by to support Sew Together. A special thank you to ALL the wonderful peoples at the Knitting Tree LA for being the most gracious and welcoming bunch we could ever ask for. If you need more fiber in your life, you need to check them out. Thank you for the continued support as we evolve and grow. Click to visit Sew Together Lounge!